Fifth Wheel Hitches: How Do They Work? A fifth wheel trailer hitch for a heavy-duty pickup truck, works similarly to that of a semi-truck and trailer. Fifth wheel hitches are designed for hauling much heavier loads than the basic ball hitch could handle. The front edge of the trailer extends over the rear bumper of the pickup truck. There’s an attachment point in the bed of the truck, rather than on the rear bumper the way a basic ball hitch attaches. When correctly installed, the weight of the trailer presses down between the cab of the pickup and the rear axle, which allows the heavy-duty pickup truck to carry a significantly greater amount of weight than a hitch off of the rear bumper. We offer some of the best brands in the business for 5th wheel trailer hitches: Pullrite, B&W Trailer, Reese, Valley, and Bulldog. The fifth wheel hitch (meaning the part that goes in the bed of the pickup truck) is a large, flat metal plate that is similar in shape to a horseshoe. There are metal rails that run underneath the hitch and attach to the frame of the pickup truck for added strength. 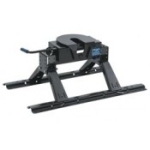 The trailer connects to the fifth wheel hitch via a downward-facing pin, usually called a king pin, along with another plate that sits on top of the fifth wheel hitch plate. The king pin locks into position making it secure within the hitch but can still pivot to accommodate twists and turns. In addition, for trucks with a short bed, Pullrite and Valley offer glider systems, which allow for easy or automatic adjustments to the spacing between the pickup cab and the trailer when making turns. ­The two metal plates, the flat plate of the trailer and the flat plate of the fifth wheel hitch, are in constant contact with each other. They slide against one another constantly, when the trailer is in motion. This requires having some kind of lubrication in between these two components to keep everything running smoothly and correctly. 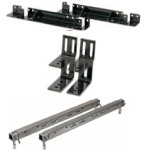 Towing equipment pricing for fifth wheel hitches vary a great deal. 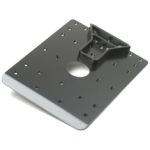 They can start at a few hundred for a basic fifth wheel hitch and up to a few thousand for a top-of-the-line model. Generally speaking, as the gross trailer weight rating for the fifth wheel hitch goes up, the price, also, goes up. In addition the high-end hitches from Pullrite, B&W Trailer, Reese, Valley, or Bulldog have various design attributes and features that increase their price and their worth to someone pulling a heavy trailer. Sliding hitches, better bearings, and heavier attachment hardware are just a few examples of features that can make a fifth wheel hitch more expensive, but also easier to use and more reliable. See our 5th wheel page for pricing, reviews, and comparisons on Pullrite, B&W Trailer, Reese, Valley, and Bulldog fifth wheel trailer hitches.